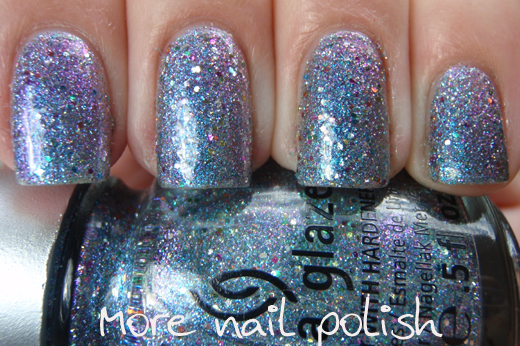 I bought the set of China Glaze Prismatic polishes quite a while back and I finally got around to trying one out. I'd read on other blogs that these are so much better in real life than they are in photos, and I do agree. Most of these have a subtle colour shift, but some of them do not. The one I chose to wear does have a good colour shift. This is Liquid Crystal and it shifts from blue to purple. In fact the colour shift is the exact same one that Ozotic 506 has. Soooo, what I decided to do was pimp up that colour shift a little bit. Here is two layers of Liquid Crystal topped with one layer of Ozotic 506 and then top coat. I love that adding Ozotic 506 on top emphasized the colour shift in this polish, but it's still so sheer that you can see all the pretty glitter particles beneath. 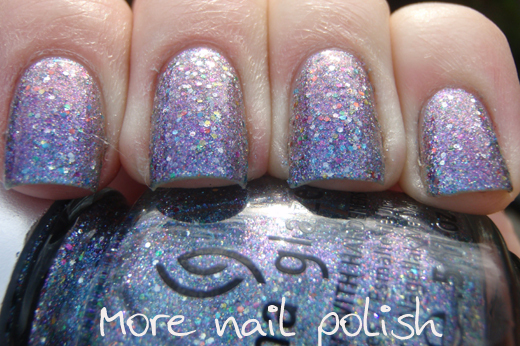 I'm totally going to try this soon with some of the other CG prismatic colours (maybe the silver one that doesn't shift much I could try the green Ozotic 503 over? hmmmmmm). Very soon after taking this polish off, I chipped the corner off my nail on my ring finger, and subsequently nubbinised. Note to self - never buff nails again to remove yellow stains. 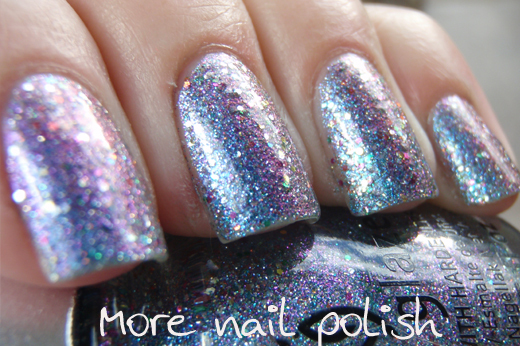 Sure it works, but my nails are so flimsy at the tips right now its breakage city. Next time, stick with the yellow and just cover it up. Ohh thats awesome! I'm wearing Optical Illusion atm (The green one). I'm gunna try it with 505 on top! Wooo! What a clever layering idea. I have Prism and Optical Illusion so I'll have to see what works over them. Love this look. I totally agree with the yellow nails thing. I just try to never be with out polish and no one knows I have Oompa Loompa nails! Great layerin idea - genius! omg, I just bought this CG today! Great idea! 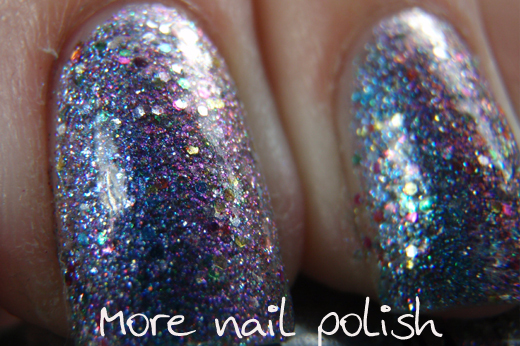 I really liked this line of polish, but the color shift wasn't strong enough to make me swoon. By layering, I see the effect I was hoping for. I will definitely try this, and I hope to see you try/swatch other laying combos with the CG and other duo/multichromes! What a gorgeous color. I love the shimmery iridescence of the polish. I just hate taking off glittery nail polishes, it takes forever! This is a terrific idea, I'll have to try it next time I wear a Prismatic. And the Prismatics definitely do look better in real life, pics can't seem to capture just how sparkly they really are. Awesome layering idea - I love it!